Given his refusal to dress-up and get into the spooky spirit of things for Halloween, I decided that Charlie and I hadn’t done enough to “inform” Little Man about the festivities in advance. No way am I making the same mistake with Christmas! So I dragged Charlie and Little Man to our local bookstore this evening looking for a thoroughly Christmassy book to read over the run up to Christmas. We already have a great Nativity Story book (My Very First Nativity Story ), so I was specifically looking for a book about Santa. Imagine my delight when I spotted “Santa Is Coming to Dublin “. It seems to be a brand new publication – I’ve never seen it in stores before. 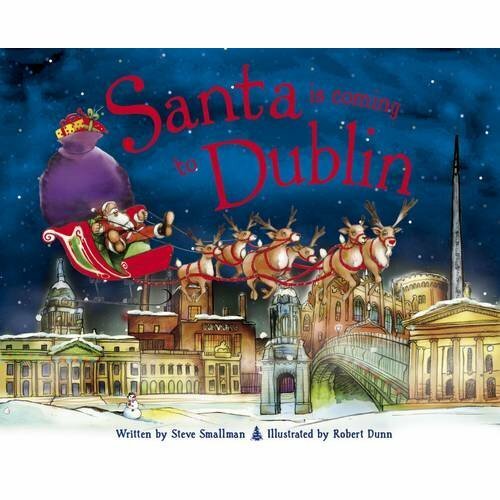 Written by Steve Smallman, and illustrated by Robert Dunn, this book tells the story of Santa and his reindeer delivering presents all across Dublin on a snowy Christmassy night. The pencil and watercolour illustrations are just lovely, featuring Santa, the elves, and the reindeer, and some familiar Dublin landscapes. I can see this book becoming a firm favourite in our house this year!